Following the appearance of videos on YouTube of people under the influence of Salvia divinorum, BBC news has questioned whether its legal status should be reviewed. A Canadian woman has successfully sued a drug dealer who sold her methamphetamine (crystal meth). The woman suffered a heart attack and spent 23 days in a coma after taking the drug. Of course Salvia divinorum should be banned! Read this Top 8 List of reasons to find out why! Back in 2008, I gave a presentation about Salvia divinorum's background and pharmacology. It was obvious when I was doing the research that scientific interest in the matter was only just developing, with papers being published at the time on topics such as which receptors in the brain the active compound, Salvinorin-A, binds to, molecular structures and plenty of speculation on what the future may hold for such a unique plant. Almost five years later, I thought it might be interesting to see how far the research has progressed - have any of the hopeful speculations been realised - so, the first thing I did was look at how many more papers have been published on salvia since then. Turns out it's a lot! The following post is a summary of a paper published last year in the journal Psychopharmacology entitled "Acute and post-accute behavioral and psychological effects of salvinorin A in humans", by Peter H Addy. The paper begins with a bit of background on Salvinorin-A, the active compound in Salvia divinorum. Unlike "classic" hallucinogens such as psilocin, LSD, etc, salvinorin-A does not bind to the 5-HT2A receptor, but instead binds specifically to the kappa opioid receptor. In the body, very little is known about the effects produced by the kappa opioid receptor, but synthetic drugs that bind to it tend to cause dysphoria (ie the opposite of euphoria, so not very nice), hallucinations and other effects we'd associate with Salvia divinorum including perceived distortions in space and time and uncontrollable laughter. Up to the point this paper was published, the author mentions the four clinical studies of Salvia divinorum on humans, only one of which was a placebo-controlled study (where an inactive dose or dummy substance is used as well), however, this particular study only had four participants - such a small sample size is too small to draw any major generalised conclusions from. There has also been relatively little research done on the subjective experiences from Salvia divinorum use, or the after-effects of use in humans. You're at a party. All the beer has gone. Things are winding down. Out of nowhere, a mate busts out something that could be interesting when lit and the smoke inhaled. Amazing! Unfortunately, this mate of yours has no way to smoke this potentially interesting material. Perhaps there's a world-wide tree shortage. Perhaps your mate just forgot to buy any papers. YOU can be the hero in this situation. Read on to find out how. As a general internet-guy, I have lots of interesting data available to me. 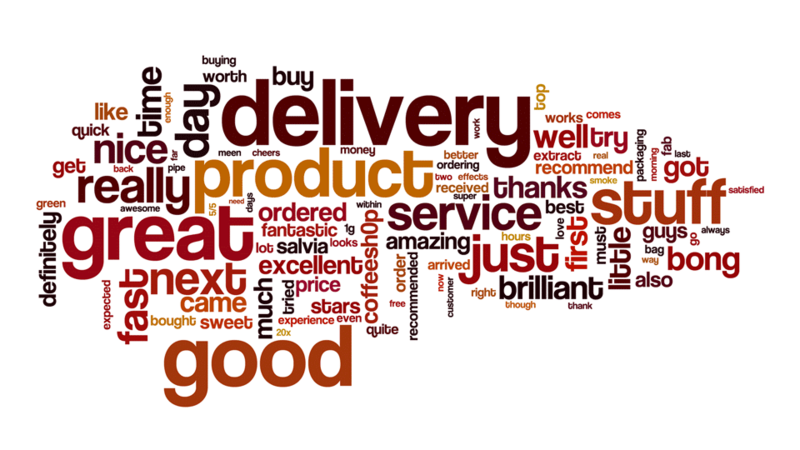 Previously, I summarised all the reviews on the site in this wordcloud - and I liked the result. Since then, I've been thinking what other data sources I could use to generate more lovely images. Then it hit me - the entire database of Salvia-Trip.net (a place people can go and write up their Salvia divinorum experiences) would make an excellent subject for a new wordcloud.